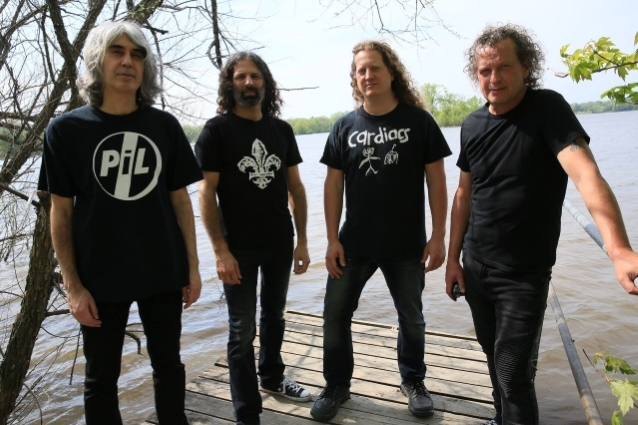 Raw Cut Media conducted an interview with members of Canadian progressive sci-fi metal innovators VOIVOD about their forthcoming studio album, "The Wake". You can watch the entire chat below. A few excerpts follow (transcribed by BLABBERMOUTH.NET). Denis "Snake" Bélanger (vocals): "I wanted to create a whole story with eight songs. They're interrelated; it was quite a job to do. So, the story itself is a bit like there's a big discovery and from that discovery, the world is going to change because there's some facts that are undeniable and from that point on, the world starts to change really fast and there's conflicts and chaos and this and that and then at the end, sort of like humanity reached another state of mind or humanity must improve the way they're thinking. It's a grow-up thing for evolution. Then it finishes in space with more a more spiritual ending with violence." Daniel "Chewy" Mongrain (guitar): "The music goes with that, too. 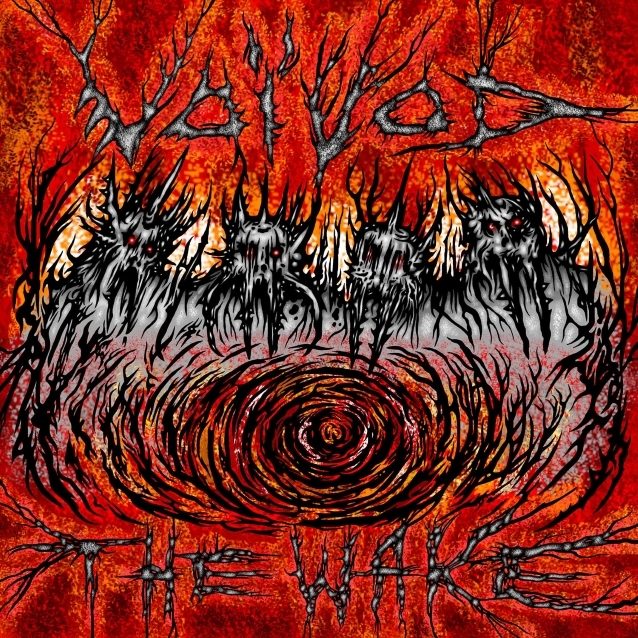 It's very complex music, very progressive with the punk, metal and thrash colors that was always a part of VOIVOD, but with a lot of intricate and odd, very rich harmonies, complementary parts between all the instruments including vocals and a lot of late motives from song to song which are transformed or hidden and reused from one song to another. It's not the kind of album you will listen to once and you'll catch everything. You have to listen to it as a journey from the first song to the end. But, as well, you have to listen to it many times because you'll discover new things all the time. It's many journeys." Michel "Away" Langevin (drums): "It's a recurring nightmare, in a way, this planet. We thought about Chernobyl back then and now it can be Fukushima or the ozone layer back then, now it's global warming. There's always inspiring stuff for us to talk about. It's just that it's more up to date, I would say, with what's going on. It's always in a sci-fi, futuristic context, but we do talk a lot about the problems that are happening in this planet. Denis: "History repeats itself, so it's always feeding us. This time around it's different because it's a concept album. It's different than the usual record. We have to think ahead of things. From the first song that goes into the second, then almost starting really writing the stuff, I had ideas and everything, but I really started to compile all those ideas and when the pacing of the album was determined, so song one, two, three, four, then I started to create the story, which is a different way than if we do just a 'record.'" Michel: "It turns out there's a lot of work to do for a concept album. The task was pretty amazing. Chewy and the engineer, Francis [Perron] they worked a lot on making everything into a cohesive product. It's like a long trip, the album, but everybody got really involved. We worked probably for about two years, I guess, pretty much non-stop. Even on tour, on the tour bus, we worked on the album. Finally, it's all complete and coming out for the Euro tour in the fall." Daniel: "I think Snake was inspired a lot by the music, for the melodies. But also the melodies bring the subject, then the music inspires him and throughout his influence about the actuality and what's going on in the world." Denis: "It's a process. You don't come…phrases like that, sometimes it's the music itself that puts you in the mood. That would be kind of like if the music inspired like a sadness, let's say, it would be lyrics going in that direction. If it's like really punchy and heavy, something's going on there, I really follow the music and I create my own stories in my head and I see images, then I start putting words in different places to kind of like build up sections and from that point, I write stuff or get inspired by the news or whatever. It's a long way. It's a long process. It doesn't come like that. Sometimes, it's the opposite. It's a melody that I'm going to do here while we rehearse, then we are going 'Hey, don't forget this!' Then I'm starting something with the melody I created on the spot." Michel: "We had some experience from 'Dimension Hatröss' 30 years ago as a concept album. We knew it was a lot of work to bring back some riffs, but we arranged them differently and so on. I think that if anything, it might be a bit easier to put the puzzle together nowadays because of software and Pro Tools. Back then, if you wanted to have a reverse effect, we had to cut the tape with the razor blade and reverse it. It doesn't mean that it's not a lot of work." Michel: "It's like using Photoshop with the magnifier at the end. You have to stop using it or you'll go crazy or you'll spend hours going over one detail that nobody is going to see." Daniel: "We developed a method, so to speak, playing together for many years and writing the EP, then for the album, we already had this chemistry and this way of working, which was working great. It has been a good journey just to write the album. It's an amazing time to spend together to find our way through the songs and structures and everything. That, in itself, is very enriching and a fantastic journey." Denis: "Once it's done, you're like, 'Oh, it's over.' [Laughs]"
"The Wake" will be released on September 21 for via Century Media Records. The disc was recorded and mixed by Perron at RadicArt Recording Studio in Canada. The album's artwork was once again created by Langevin and can be seen below. VOIVOD's first European touring run in support of "The Wake" features the following rotating support acts: MAGGOT HEART (September 7-16), NIGHTRAGE (September 18-26) and BIO-CANCER (September 28 - October 20).